I paid a brief visit to LACMA recently. It occurred to me that it would be a nice place to get an espresso in the sunny afternoon and it’s not far from where I live. Not much was open there at the moment, due to construction of some new buildings, but their permanent collection was open and I have a membership, so I figured I’d take a quick stroll. 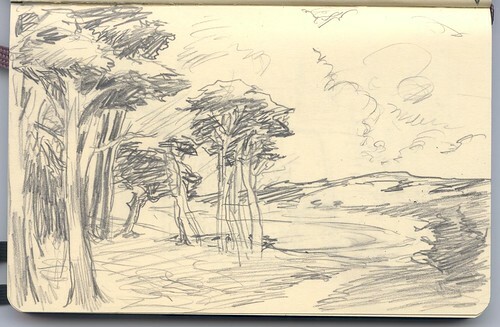 I stopped at this painting by Arthur Mathews titled, “Monterey Cypress” and decided to sketch it. These types of cypress trees are pretty common in my hometown of San Francisco, so it instantly called back fond memories and feelings of home. There is a sort of softness and friendliness in these trees and this landscape.